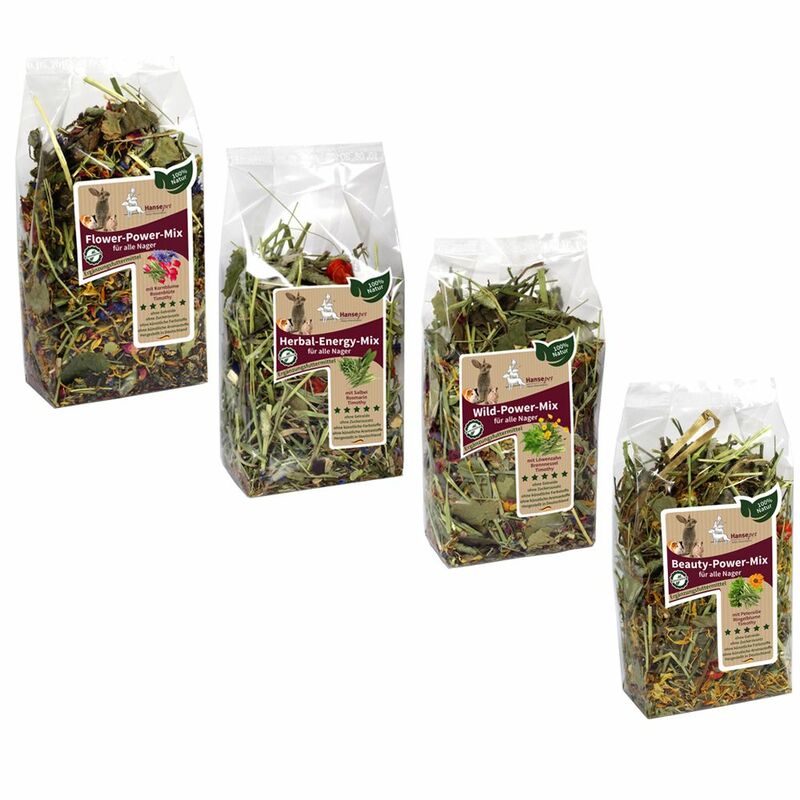 Flower Power for your small pet: Hansepet Flower Mix makes a great snack for between meals with 4 x 100g different herb flavours alongside your pet's daily portions of hay and fresh greenery. The mixed 4-pack is grain-free and completely natural. It contains no sugar, colours or flavourants and is made in Germany. Flower Power Mix - Cornflower and Rosebuds: a delicious mix of high quality wild flowers ingredients that's species-appropriate and natural. Rounded off with cornflowers and rosebuds for dental abrasion thanks to the natural, rough texture. Beauty Power Mix - Parsley and Marigold: the healthy combination of different herbs like parsley and oregano can help detox, clean and disinfect the intestinal tract. This boosts the appetite and digestion. The anti-inflammatory effect of the marigold can help combat bacteria and fungi. Wild Power Mix - Dandelion and Nettle: a productive mix for a species-appropriate, natural diet. The ideal blend of leaves and graΒes made from high quality wild herb ingredients and rounded off with dandelion and nettle. The rough texture also promotes dental abrasion. Herbal Energy Mix - Sage and Rosemary: lots of different meadow herbs for a healthy, species-appropriate diet. The mixture contains fresh graΒ and fragrant herbs, is light and hand-packaged. The natural, recognizable structure supports the immune system and healthy intestinal flora. Hansepet Flower Mix at a glance: A supplementary feed for all small pets Mixed 4-pack with 4 different herb flavours each weighing 100g Great snacks for between meals: to supplement normal daily feed with hay and fresh greens Grain-free Completely natural: no sugars, colourants or flavourants Made in Germany.